Plans for the new athletic center that is to be built at Paly were unveiled at a school board meeting Tuesday night. The main gym is to the rear (flat roof), while a secondary gym is in the forefront (peaked roof). Rendering courtesy of Tolbert Design Architects. 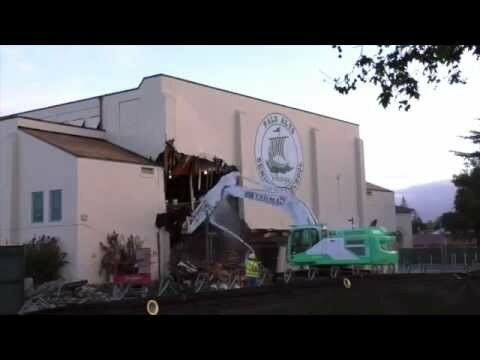 Palo Alto High School's "Big Gym," where NBA star Jeremy Lin played and famed wrestling brothers Dave and Mark Schultz grappled, was demolished on Wednesday morning, Sept. 2, to make room for a multi-million dollar state-of-the-art sports complex. Crews began knocking down walls, crunching wood and hauling out metal beams at about 7 a.m. A group of spectators gathered at the bleachers by the beloved gym to watch the demolition, including a class of P.E. students who went "ooh" and "aah" as two diggers knocked down parts of the building. Demolition will take up to 10 days, according to Bob Golton, the school district's bond programs manager. A new athletic center, funded in part by a local family who have sent three generations of members to Paly, is planned for the site. The Peerys have donated $24 million to help build the new gymnasium. The planned sports complex  two gyms connected by an enclosed loggia, or hallway  will wrap around three sides of Paly's existing swimming pool. The dedicated square footage for Paly's athletic purposes will more than double the current space, according to the school district. The gym was home to Paly boys basketball and girls volleyball, which won state titles in 1993 and 2010, respectively, as well as decades of sock hops, proms, concerts and private milestones. To see video of the demolition, visit the Weekly's YouTube channel. I know that we often comment about the removal of old landmarks and businesses, etc. in wistful sorrow, but this time represents the improvement that all progress seems to promise. The new site drawing looks great. Good-bye, old Paly Gym...you were the one place on campus where I felt comfortable. Paly is a public taxpayer-funded school. Will Paly hold an Open House day to the public once the new gym is built? I graduated from a nearby high school over 30 years ago and the equipment in our school gym was primitive compared to some state of the art gyms of today. I'll probably drool with envy if, and when, I get to see the new Paly gym. They might have an open house, but you really need to contact the school district directly rather than ask an anonymous forum. Note that just because something is built with taxpayer money doesn't necessarily entitle Joe Taxpayer to examine every single square inch of everything that was paid with tax dollars. You don't get to visit the Department of Energy's supercomputer room, nuclear submarines, or even a waste treatment plant. That said, you are welcome to attend a regular sports event, just as you were welcome to do so the past 86 years at the old gym. Glad for the future of Paly, but I feel bad for the current students being there during all these years of construction projects. I hope some of them get to enjoy the new performing arts center and the gym before they graduate. @Von: Yeah, construction at both ends of campus. A shame the gym was delayed and they didn't start earlier during the summer. So when will the portables be removed? > everything that was paid with tax dollars. And just what laws make this snippet from a post above true? Why wouldn't everyone want a transparent government, rather than one that is not transparent? I ask myself as I prepare to go to Back to School Night, whether I will recognize and know my way around this strange looking, unfamiliar campus? Any predictions whether the new gym will last 86 years? Or whether the school will still be called Paly? From the description and video, the PAUSD didn't hire a demolition crew that would salvage usable wood or metal from land fill. So much for Sustainable Schools committment! Money doesn't just talk, it rules this school district. The city requires recycling of demolished structures. Plus they had already removed all of the interior fixtures. ....including the gym floor...which they plan to cut up and auction.